As I reported at the time, Linden Lab announced at the end of 2016 that they would re-open applications for Skill Gaming creators and operators on Tuesday, January 3rd, 2017, and this went ahead as planned. 1) whose outcome is determined by skill and is not contingent, in whole or in material part, upon chance; 2) requires or permits the payment of Linden Dollars to play; 3) provides a payout in Linden Dollars; and 4) is legally authorized by applicable United States and international law. The current Skill Gaming policy was introduced in 2014, and the announcement of the re-opening of applications marked the first time the Lab has offered the opportunity for further Skill Gaming Creators (SGCs) and Skill Gaming Operators (SGOs) to register their desire to create and / or operate skill games in-world since that time. However, the application period was fairly short – a little over a month, in fact. On Tuesday, February 7th, the Lab issued an update indicating that as of that date, applications were once again closed. It’s not clear how many new applications were received and are being processed, however, prior to applications re-opening. the Second Life Skill Gaming Approved Participants page on the SL wiki listed 45 SGOs. At the time of writing this article, the total had risen to 50, and the number of approved Skill Games had risen from 44 to 45 (neither of these increases account for any applications which the Lab may still be processing, if any). Those interested in playing Skill Games, or in finding out more about them, can follow the links at the end of this article, or they can visit the Lab’s Gaming Islands. Accessed either directly or via the Portal Parks, they provide information on what Skill Games are, the kinds of games user might encounter, how and where they can be played – and why, in some instances, users may not be allowed to access the regions where they can be played. On December 1st, 2016, Linden Lab announced they would be accepting a new round of applications from those interested in becoming Skill Gaming Operators and / or Skill Gaming Creators. 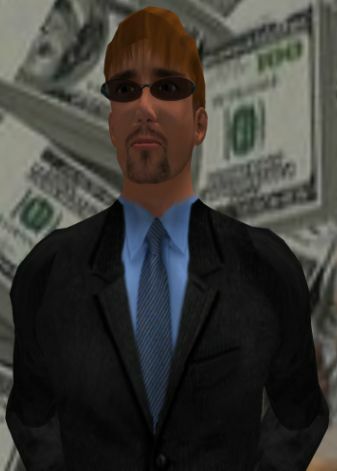 As we blogged back in the Summer of 2014, gambling is strictly prohibited in Second Life and operating or participating in a game of chance that provides a Linden Dollar payout is a violation of our Terms of Service. However, games of skill are legally permitted in many jurisdictions, and we’ve seen that many Second Life users are interested in playing such games for Linden Dollars. We updated our gaming policy in Second Life at that time and opened applications for Skill Gaming. Skill Gaming applications will reopen on January 3, 2017, for those who wish to become authorized creators and/or operators of Skill Games in Second Life. Skill Gaming is covered by the Second Life Skill Gaming Policy, which in turn is supported by a Skill Gaming FAQ.The latter will have a link to the Skill Gaming Application form, once applications have re-opened on January 3rd, 2017. All Skill Games in Second Life must be created and / or operated by Lab approved Skill Gaming Creators (SGCs) and / or Skill Gaming Operators (SGOs), and must be located within Skill Gaming Regions. The latter must be Full regions, which cannot be located on the Mainland, and cannot be located adjacent to non-Skill Gaming Regions. They have an increased maintenance fee (tier), which (at the time of writing) is US $345 / month. Existing Full regions meeting the criteria above can be converted to Skill Gaming Regions for a one-off fee of US $100 per region. The Skill Gaming Policy sets out all requirements in full, and should be read, along with the FAQ, by anyone wishing to become a Skill Gaming Operator and / or Creator, or who wishes to access Skill Gaming regions and participate in the games on offer. The first round of Skill Gaming applications in 2014, took somewhat longer to come into effect than the Lab had planned, and several applicants experienced some delay between submitting their application and receiving confirmation of acceptance (or refusal). In the end, some 45 SGOs, five of whom are also registered as SGCs, and between them, they provide 44 skill games in Second Life. In August 2016, and as a way of introducing Second Life users to Skill Gaming, Linden Lab introduced Gaming Islands. These can be accessed either directly or via the Portal Parks and provide information on what Skill Games are, the kinds of games user might encounter, how and where they can be played – and why, in some instances, users may not be allowed to access the regions where they can be played. In a blog post on August 2nd, 2016, the Lab introduced their new Gaming Islands: regions designed to help Second Life users – particularly (but not exclusively), I would assume, new users – understand Skill Games in the platform, how they can play them (and why they may not be able to play them), together with a means to find them. I’m not sure when these regions – there appear to be two at present – opened, so whether the blog post has been timed to coincide with their launch or whether, like much that is in the blog post, they’ve been around a while but simply not promoted, is hard to tell. However, on reading about them, I jumped over to take a look – but before I get into the details, a quick bit of background. Gambling laws in the USA and around the world can be complicated beasts. What some might consider to be gambling to others might be viewed a game of skill, and vice-versa. This makes determining what is and isn’t allowed and by whom a difficult practice, particularly where the Internet is concerned. Because of all this complexity, the Lab banned gambling in Second Life, whilst allowing games of skill to remain. Then, in 2014, the Lab sought to further refine the kinds of skill games involving money and payouts which are permissible in SL through a complete overhaul of their Skill Gaming Policy, together with the introduction of new Skill Gaming regions where such games can be played. The new Gaming Islands are designed to help SL residents understand what Skill Games are, where they can be played, the kinds of games they might encounter, how they can get to play them – and why, in some instances, they may not be allowed to access the regions where they can be played, and finally to offer a means to reach Skill Gaming regions. To achieve this, the new Gaming Islands are split into four areas: the arrival point, a game play area; a Learn area which explains more about Skill Games in SL and how to access Skill Gaming Regions; and an Explore area which provides direct teleport portals to Skill Gaming regions provided by various in-world Skill Gaming Operators. The game play area offers what appear to be “skill-based slot machine” games (yes, there are such beasts in the physical world) with L$ pay-outs – although I have to admit, even after reading the instructions, I was unable to determine where the “skill” factor came into effect over and above the “chance” element (the requirement for Skill Games in SL is that their outcome “is determined by skill and is not contingent, in whole or in material part, upon chance”). This is not to say that I think the games are not skill-based, but simply that – as a non-gambler / player of skill games, I simply didn’t get where skill enters into them, even after reading the instruction tabs. Perhaps this might indicate more practical explanations are required, or maybe it just indicates I just don’t get Skill Games. I’m also a little mystified as to why, more than an hour after I left one of the islands, the GamingIsland Operator made a small payment to my account – but hey-ho (addendum: apparently pay-outs are made at regular periods after play). The Learn area, designed to get people up-to-speed with Skill Gaming in SL, how they can ensure they are eligible to access Skill Gaming regions and why, even if they meet the SL criteria, they may still be unable to do so, is a little more straightforward. To one side of the are a series of information boards designed to help people ensure they can access Skill Gaming region; on the other are explanations of what Lab’s define a Skill Game (lifted from the Second Life Skill Gaming FAQ), together with information on why, legally, some SL users may not be able to access Skill Gaming regions even if they meet the SL criteria for doing so. The split path perhaps isn’t the best approach here, given it might encourage some to simply go around one side and then up the stairs to the final section, but the use of teleport boards in the final section makes this a minor quibble. This final section, entitled Explore, offers teleport portal directly to a number of Skill Gaming regions provided by different Skill Gaming Operators. Should anyone find they cannot use the teleport portal, boards between the portals will teleport them to the Learn section of the island where they can double-check they meet the SL / legal (in the case of US residents) requirements for accessing Skill Gaming regions. Skill Gaming isn’t to everyone’s interest, to be sure. However, providing information on what it is and how to find it is, I would suggest, a good idea, as is joining the dots for new users to be able to find their way to such regions, which give the opportunity to play for Linden Dollars. As it is, Skill Gaming operators pay a premium for their regions, and so providing a means by which they can obtain traffic on the same footing as other types of activity in SL is only fair. In terms of the Gaming Islands layout, and my own problems in “getting” the games aside, the design is straightforward and does pretty much exactly what it says on the tin. Which is all one can ask, really. As regular readers know, I’ve been reporting on the Skill Gaming Policy changes, including the situation involving the stock market simulation game Capital Exchange (CapEx), operated by Skip Oceanlane. Since my last report in December 2014 there have been a number of updates from Skip on the matter to keep CapEx members informed of progress, of which the April 18th, 2015 is the most important. Future options may include the ability to support additional currencies – GBP, the Euro, etc., and other virtual currencies such as Bitcoin, Litecoin, etc. The new service currently has a projected start date of July, 2015. Now for you “old-timers” I already know what you are thinking – this is what was done when SL banks failed in 2008 at the old “SLCapEx” as well as a defunct fund at a defunct exchange called the “World Stock Exchange”. Deposits were converted to worthless stock, and no one ended up getting their Lindens back. Well this time, it will be greatly different. I will be maintaining a Buy Order at roughly 5% above the value of what was created/purchased. So anyone that wishes to “cash out” will actually make a profit, if they do not withdraw before May 10. It’s also an incentive for people to stay with Capital Exchange, and to continue playing the game. Note that I plan on adding assets to this fund, so it will be generating a monthly dividend. Saturday November 1st brought with it a full enforcement of the the Lab’s updated Skill Gaming Policy, as the last had previously notified would be the case. As I reported at the time, an immediate casualty of the enforcement was Skip Oceanlane’s Capital Exchange (CapEx). Although described as a fictional stock market simulation game which does not offer any opportunity for direct real-world investment or profit, CapEx does operate on what amounts to a “pay to play basis” through the trading of L$-valued “securities” in the SL-based companies listed with the exchange, and thus appeared to fall under the remit of the Skill Gaming Policy. This being the case, Skip had placed an application for CapEx to become a Skill Gaming activity with the Lab in July 2014, just after the announcement of the new policy. However, by November 1st, the application had yet to be approved, prompting CapEx to suspend market activities (although ATMs remain open for L$ withdrawals) pending further feedback from the Lab on the matter. I’m not going to get into detail of what those 3 issues are, but I’ll restate what my attorney told me. One issue is easy, another issue is not so easy, and one issue is difficult that will require a detailed response. After talking with my attorney, it was decided that we would meet again after he sends me information requested by the Linden Lab attorney. I am going to come up with a detailed response to each area of concern, and my attorney’s law firm will put it into “Legalese” as a response to Linden Lab. It had been hoped these responses would be put to the Lab prior to the Christmas break, but whether this was achieved or not is unclear, as there have been no further updates. However, at the time the last blog post appears, Skip was hopeful a resolution could be reached in early 2015, which the Lab also appears to be keen to achieve. This doesn’t automatically mean that CapEx will be able to resume trading; it is still unclear as to which way the Lab’s final decision will lean. But as Skip does note, at least progress is being made, and both sides are working to resolve matters such that informed decisions can be reached. At that time, there had already been a delay in the introduction of the new policy (from August 1st through until September 1st) to allow additional time for applications and applications processing. The end of October saw further additions to the list of Approved Participants, such that some 94 regions have been reclassified at Skill Gaming regions, each of them offering a mix of games from a pool of 56 games from five approved Skill Gaming Creators. Please refer to the Approved Participants list for an idea of the spread of actual Skill Gaming Operators. However, the enforcement deadline has brought with it one casuality, although hopefully only temporarily. 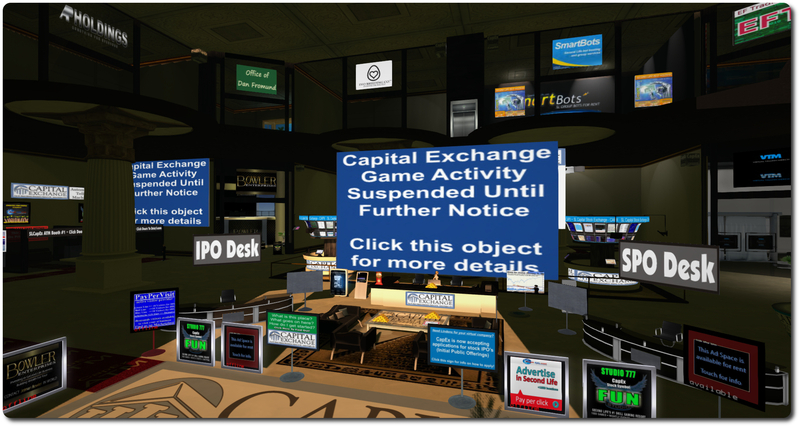 Capital Exchange (CapEx) is a fictional stock market simulation game, and although it does not offer any opportunity for direct real-world investment or profit, it does operate on what amounts to a “pay to play basis” through the trading of L$-valued “securities” in the SL-based companies listed with the exchange. As such, it falls under the remit of the Skill Gaming Policy. Capital Exchange’s application to become a Skill Gaming activity lodged with Linden Lab since just after the new policy was originally announced July 2014, including a reasoned legal opinion from their legal counsel outlining why CapEx is a game of skill under federal and New York State laws. However, at the time the deadline was reached, they had not received formal approval as a Skilled Gaming Operator from the Lab, which has forced CapEx to suspend market activities activity until further notice. As a result of this move, as the blog post goes on to state, all trading, including person-to-person transfers (unless they were authorised before the trading halt), payment of dividends is suspended, as is any other activity carried out through Capital Exchange which would violate the Lab’s Skill Gaming policy. However, all other aspects of CapEx, such as posting to the forums (including company news etc. ), continues. The announcement also notes that CapEx ATMs will still be in operation for those wishing to deposit / withdraw L$, as the Lab has not indicated that doing so would be violating the new policy. Please refer to the CapEx blog post for detailed information on the suspension and planned steps, and to the CapEx website for further updates on the situation. 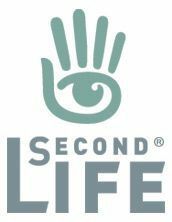 It is not currently clear if other gaming operators within Second Life have been similarly hit by the deadline being reached prior to their application being approved or turned down. It is also not clear whether the deadline for enforcement was set as a result of external pressure to comply with legal requirements, or as a result of an arbitrary decision on the part of the Lab. If it is the latter, it is hard to fathom why the Lab opted for a blanket enforcement of the policy, rather than allowing further dispensation for those operators / creators who have submitted applications, particularly where the delays in approval appears to lie with the Lab’s own handling of applications (as seems to be the case with CapEx). With thanks to Nalates Urriah for the pointer to the CapEx blog post.